Deputy Speaker of Parliament Wednesday, 4th October, cautioned Ministries, Departments and Agencies (MDAs) to take their work very seriously and address issues relating to accountability and transparency in line with the Auditor General’s report. Hon. Segepoh Solomon Thomas, who doubles as Chairman of the Public Account Committee (PAC), made the call while addressing witnesses from the Ministry of Social Welfare, Gender and Children’s Affairs (SWGCA) and others from the African Peer Review Mechanism (APRM), under the Ministry of Political and Public Affairs. The call was made at the ongoing public hearing in Committee Room 1 in relation to some queries raised in the 2015-2016 Auditor-General’s Report, with regards irregularities related to payments without adequate supporting documents, non-payment of withholdings taxes to the National Revenue Authority (NRA), among several other issues. The Deputy Speaker allayed the fears of witnesses, noting that the public hearing was not to intimidate anyone but to uphold public financial management and accountability for state funds disbursed by the previous government for MDAs to undertake national development programmes in 2016. He encouraged every witness not to tell lies. 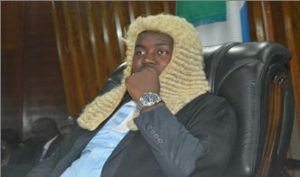 “If you tell lies under oath, you would be charged to repay state funds disbursed to MDAs to move national development forward while such development aspirations are often not achieved due to certain unpatriotic actions by MDAs.The public hearing is one of the tools used to look into these accounts established by government,” he said. Meanwhile, Hon. Thomas stood down the witnesses from the aforementioned ministries on the grounds that senior officials, including former Permanent Secretaries and Accountants who worked under the past administration were not present to answer to probing questions from the Committee. “The probing cannot not proceed when those that were in office during the audit are not present to explain how they spent state funds,” he said. The witnesses were asked to re-appear before the committee on the 15th and 16th October, and they were further advised to come along with former officials, as directed by the committee.